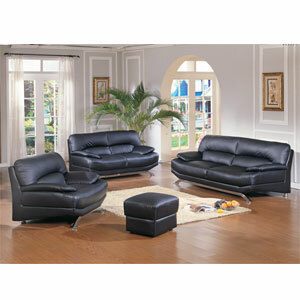 100% Soft Bonded Leather Living Room Set In Black. This Set Features A Sleek Contemporary Design Accented By Chrome Legs. Can Be Purchased As A 3-Pc Set Or Sold Separately. The Set Includes Sofa, Loveseat And Chair. Also Available (Sold Separately) Matching Leather Ottoman. Strong Construction. Easy To Assemble. See Related Items Below For Similar Living Room Sets.